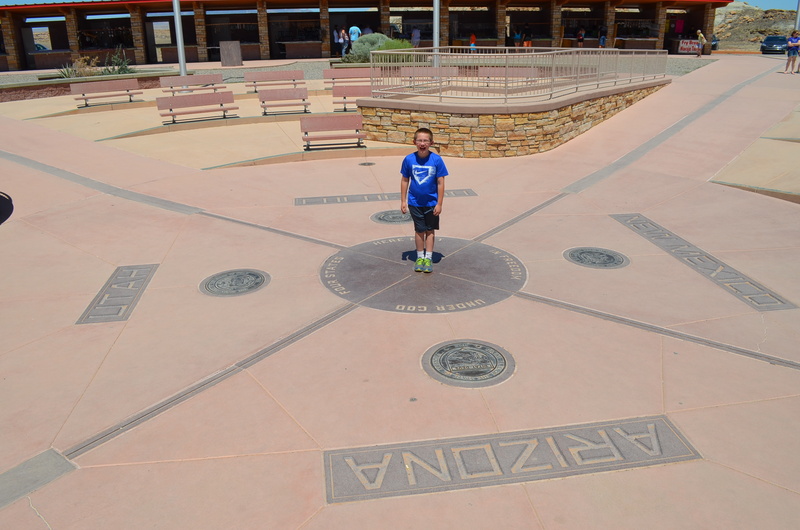 The Four Corners Monument is a very *short* stop off U.S. 160, at…well…the junction of four states. 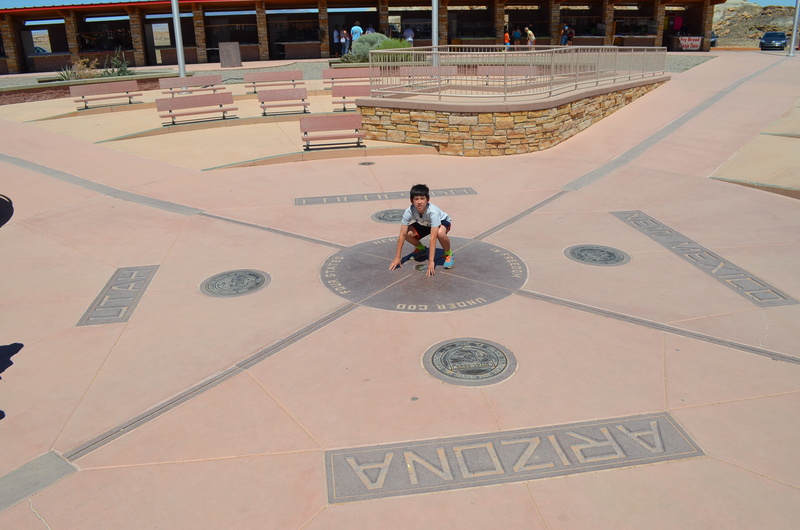 You can’t drive between southwestern Colorado and New Mexico/Arizona without stopping briefly at the Four Corners Monument. The monument is operated by the Navajo Nation. Since we were in the Navajo Nation. 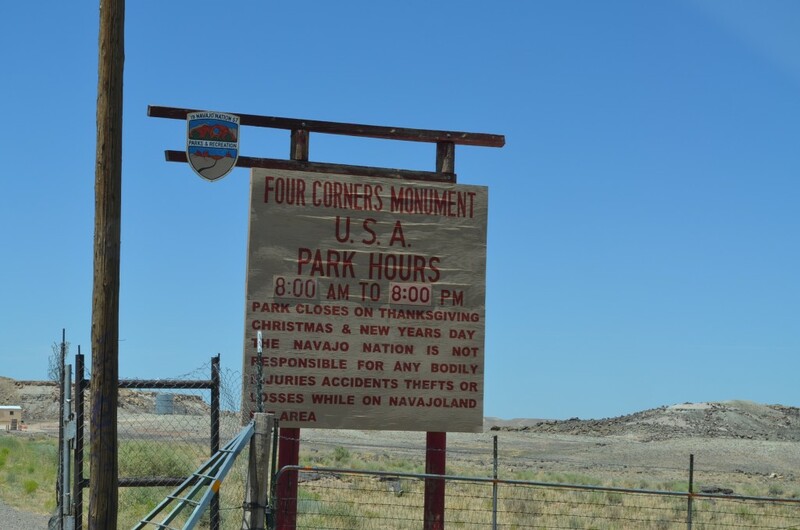 We paid an entry fee of $5 per person to enter the monument area, and what I saw was quite surprising. Not in a good or bad way, I simply didn’t know what to expect. The Navajo Nation is an autonomously-governed nation with an area greater than the state of West Virginia. It was established by the Treaty of 1868 as reparation for the attempted deportation of Native Americans in 1864. You can read more about it here. There isn’t a lot of fanfare advertising the monument. 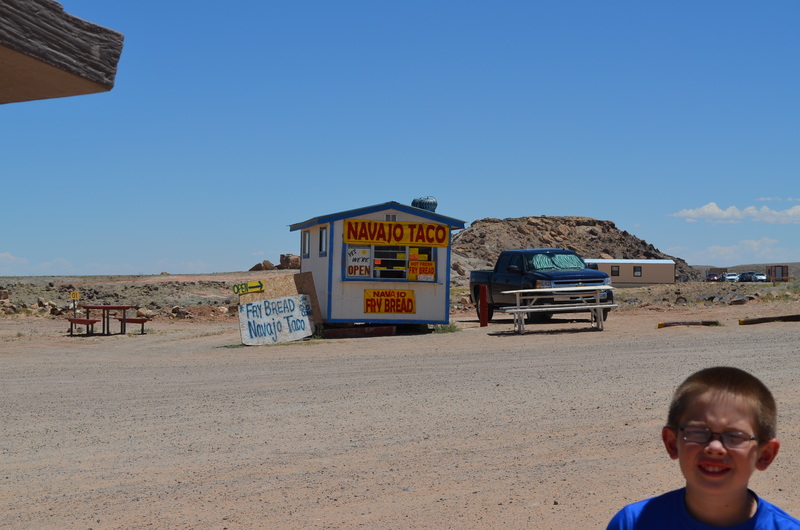 There were several Navajo taco stands such as this one. There isn’t much to it. The monument itself is very lovely, with brass markers showing the four states’ borders and very tall state flags clearly marking each quadrant. There is usually a line of people waiting to photograph themselves right at the crossroads. We waited about 20 minutes in the early July sun to take the photographs you see here. There is a bucket full of umbrellas that we could use to shade ourselves, but the only umbrellas left were broken. That’s okay, we had sunscreen and plenty of water. As you can see on the map above, there is a reddish-colored square surrounding the monument. Those are rows of vendor stands. We were there on a Tuesday, and about 1/3 of the stands were occupied by Native American artisans selling pottery and jewelry. We didn’t get any of the pottery or jewelry. On each end stand were frybread and Navajo taco vendors. We did get food. 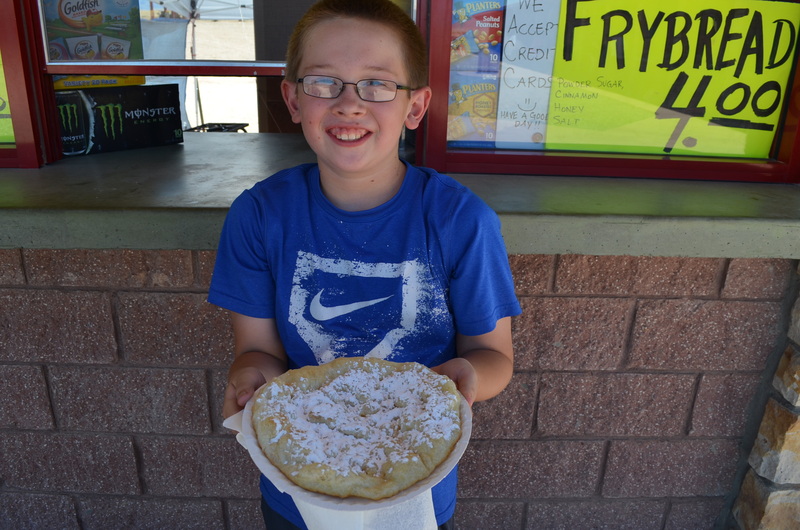 Frybread! It’s really good! I need to learn to make it at home. 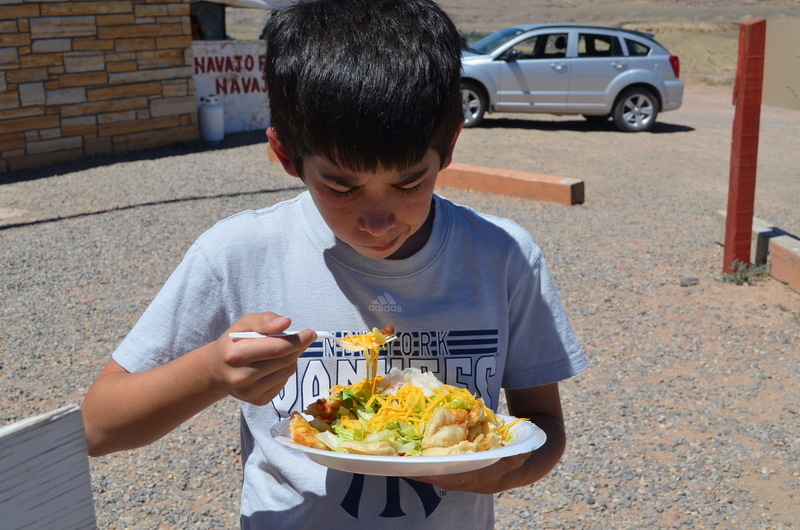 Meanwhile, Jacob had a Navajo taco. It was enormous! It’s a circle of frybread with taco toppings: meat, lettuce, cheese, and tomatoes. Jacob ate most of it, and I picked at it and can vouch that it was delicious. We spent about an hour at the monument, with 1/3 of that time dedicated to waiting to photograph ourselves at the crossroads. Admission is a $5 per person donation to the Navajo Nation, and you must pay cash. The nearest town with an ATM is in Teec Nos Pos, Arizona, about 5 miles southwest of the monument. There is no electricity or running water at the monument so don’t expect to be able to charge cell phones or anything like that. There is plenty of food and beverage for sale. The restrooms are the waterless types, so don’t sit downwind of them to eat your Navajo taco. Make sure you wear plenty of sunscreen and have water on hand before your visit. For us, coming down from Durango, it was much hotter than what we had been experiencing the past several days. DIY Kitchen Transformation: The Big Reveal! My First "Cupcake" Cake -- a Penguin!